Cold-hardy Mexican variety avocados have a high oil content, giving them a rich flavor, and a thin, edible skin. These are fruits we just harvested in Oliver Moore’s yard. Fruits just like these will be available for tasting at the workshop July 29. My friend Oliver Moore has been growing these Mexican avocado varieties here in the Gainesville, Florida area for twenty years, and has accumulated a large amount of experience in how to get them to thrive and produce crops. On Sunday, July 29, Oliver will host a public avocado workshop at his home just outside Gainesville. He will be talking about how to plant and care for these varieties, how to propagate them, dealing with pests and diseases, and the characteristics of the different cultivars. He will lead a tour around his yard, showing the various avocado trees he has growing there, many of which are carrying nice crops of fruit. 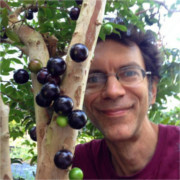 A number of seedling cold-hardy avocado trees have come into bearing in Oliver Moore’s yard in Gainesville, showing mixed characteristics of multiple excellent parent avocado varieties. Best of all, there will be a fruit tasting, where samples of some of the early-ripening fruits of these varieties will be available to taste. If you want to start your own planting of avocado trees, Oliver will have cold-hardy avocado plants available for sale, both seedling and grafted, as well as a number of other types of fruit trees that he grows in his nursery. The seedling avocado plants Oliver has available have the potential to have very interesting genetics. 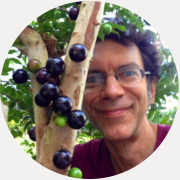 Oliver started out planting named-variety cold hardy avocado varieties in his yard, but over the years those plants cross-pollinated and and many of the resulting seedlings have come into bearing with excellent fruit. Having all those excellent varieties all in close proximity, all pollinating one another, means that Oliver’s small property has become probably one of the leading hot spots of cold-hardy avocado germplasm in North Florida. Seedlings from this population have a good chance of being becoming the next generation of excellent named cultivars. This event is on Sunday, July 29, from 10 to 2. Be sure to arrive at the early end of that time frame if you want to participate in the fruit tasting. WARNING: Do NOT use Google Maps to get there; it will very likely take you to the wrong location. Bing Maps gets this address correct, here is the Bing map for Oliver’s place. -Head east on University Ave (26) out of town. Make sure stay on University Ave, and don’t take the split to the right where Hawthorne Rd (20) forks off on the right. -You’ll see a flashing yellow light ahead. Before you get to it, take a right onto NE 22nd Ln (if you pass the flashing yellow light you’ve gone too far). NE 22nd Ln is a narrow, unimproved dirt road with limited visibility of oncoming vehicles; drive SLOWLY all the way to the end and park. If parking fills up it may be necessary to park on the side of the main road and walk in. Here is the workshop’s Facebook event page. Is there a basic size and price for plants? Oliver says most of the grafted avocados are in five-gallon sized pots and are $40. The seedling plants are recently field dug and potted, and range from $5 to $25, depending on size and condition. This is a recent, post beetle post. What are y’all doing about the invasive (from Asia) Redbay Ambrosia Beetle and its associated fungus, Laurel Wilt Disease? When I went to U. F., native Perseas (redbay & swamp bay) and their associated wildlife like the Palamedes swallowtail were extremely common. Now I see pictures of blighted forests that have basically resulted in reproductive extinction (some trees will re-sprout from the roots, but nothing survives to bear fruit). All tested (non-Asian) species in the laurel family, including avocados, are susceptible to these pests (& die). So far spicebush (Lindera species) often escapes because its twiggy branches are too narrow to be attractive food sources for the vector beetle (when artificially inoculated by the fungus, the shrubs still die, and the beetles seem attracted to the smell of the plants, but leave for better trees which can provide more food). However if all other food is exhausted (this will take some time unless fire removes all the biomass, as both the beetle and its fungus will continue to eat dead wood [technically the beetle farms and eats the fungus, which eats both living and dead wood in the laurel family]), will they continue to be spared? Who knows. Can you prune avocados to stay very twiggy and essentially lacking trunks? Would such trees fruit? (I am guessing you would need to support narrow branches carrying fruit with fencing.) Has I.F.A.S. (University of Florida) or other people come up with other effective control strategies that may work for homeowners if not forests (high attention/labor might be needed)? To clarify, I left Gainesville in 1999, before the beetle arrived in the Savannah area, let alone reached Florida. Hi Erik, thanks for commenting. We’ve now been living with Asian ambrosia beetles and Laurel Wilt for about a decade in this area, and so far it’s seeming a lot less scary than we initially thought. Occasionally it kills an avocado tree, but others nearby seem fine, and keep on fruiting. Around 2009, two of my avos got Laurel wilt. One of them died altogether. The other died to the ground, resprouted, and after several years came into bearing, and it’s cropped every year since. I know a few mature red bay trees that are still looking fine. Oliver, who’s giving the workshop, lost several of his biggest avocado trees to flooding after Irma last year, but one was probably 40′ tall, and not having any problem with LW when the hurricane killed it. He has other, somewhat smaller trees that have been fruiting for a number of years. I know UF/IFAS is working on LW – I’ve heard of some very promising leads they are investigating. My daughter grew an avocado plant from seed of fruit bought at Publix (I think Haas variety, Type A). Plant is about 2 years old. I would like to purchase a type B plant or cold hardy one to graft a scion to the Haas (basically attempt to speed possibility of fruit on plant my daughter grew). I live in Jacksonville FL. Any recommendations of type plant to purchase and where I could purchase? I don’t know for sure, but I suspect that the seedlings of an “A” type could be either “A” or “B”. It probably doesn’t matter much whether an avocado variety is “A” or “B” here in North Florida, because the cold hardy types flower in winter, and during cool weather the daily flowering period of the two types overlaps enough to allow any variety to pollinate any other, even to self-pollinate. ‘Hass’ is from the Guatemalan group of avocados varieties, which are generally somewhat less cold tolerant than the Mexican subspecies, so a Mexican scion top worked onto a Guatemalan rootstock would get killed by any temperatures cold enough to kill the rootstock. But if you do want to try it, any of the Mexican varieties might work. Some of the more common ones are ‘Opal’/’Lila’, ‘Wilma’/’Brazos Belle’, ‘Joey’, ‘May’, and ‘Del Rio’. Thank you for the thorough and quick reply. Any recommendations of nurseries where I could purchase the varieties you named in the area between Jacksonville and Gainesville? The only place I know which has these varieties available in this area is Oliver Moore, who sells them at his backyard nursery in Gainesville. I’ll send you Oliver’s phone number by PM (he doesn’t want his number published online because of the danger of spam-bots finding it). I am so interested in fruiting trees and would love your expertise in their cultivation. I am planting a yard soon and cold hardy avocado is number 1 on list with pomegranite and citrus. If I have more room a few more favorites. Hi Annie, thanks for commenting. Cold hardy avocado and citrus can definitely do well in North Florida. Pomegranate is more challenging – fruit production is sporadic at best in our humid climate. Right now I’m super busy and my property isn’t well set up for visitors, but I hope to get things better situated later this year to be able to have people visit and buy fruit trees. In the mean time, Oliver who I mentioned in the post is already set up with his nursery, and can sell you cold-hardy avocado plants right now. I’ll direct message you his contact information.